Electronic Dog Fence Installations: Installing your Pet Stop system involves four steps that our skilled Pet Stop installers are happy to explain in more detail. They’ll get you started from day one by assisting you throughout the process. Be sure to call us out today for a free on-site evaluation. Bury the commercial grade 14-16 gauge life time boundary wire in the location ideal for your specific yard and dog. We will walk the area with you and explain exactly what, where and how the wire will be installed. We will have your utilities marked, activate your sprinkler system and bury your wire 6″ deep protecting is from the work of your landscaper and lawn man. Install the Digitally Modulating Pet Stop signaling OT-300 Transmitter and all other Computerized Electronics in a convenient location. Fit and customize your pet’s receiver with the program that’s best for you and your pet’s breed, personality and disposition. We will flag your new fence and train your dog with you. You will receive a complete orientation to your new Pet Stop Dog Fence before you leave your home. The installation usually takes 3-4 hours for an one acre property. Perform the initial training session to ensure your pet is properly introduced it their new system. We are available by phone and in person should you have any questions or concerns after the Professional Installation. The boundary wire is typically buried 6 inches below the surface. This wire receives and transmits a harmless, state of the art, digital radio signal from the transmitter encoded, so it doesn’t interfere with your neighbor’s system and theirs will not interfere with yours. Your dog will always be located safely in your yard 100% of the time. Because of our technologically advanced modulations processors and duel functioning Pet Stop dog receivers, your family pet will NEVER experience a false activation of his collar due to an aberrant signal. The wire is installed around the entire area in which you want to contain your pet. The radio signal transmitter is typically located indoors near an electrical outlet, where it can be easily attached to the boundary wire. We are also able to install the OT-300 outside in a water proof box if needed. 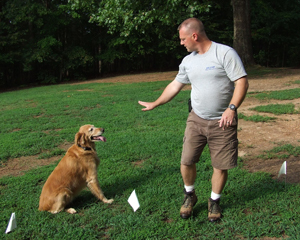 Training is a crucial part of the Pet Stop method. Different breeds and personalities require different approaches, and we are uniquely qualified to custom tailor every training session to ensure the smoothest transition possible for your pet. We have successfully contained over 4000 dogs in Pet Stop Dog Fences and they are all safely playing and enjoying their yards.